Get quick answers to some of the most commonly asked questions. If you can’t find the answer you’re looking for here, contact technical support. What does "DC" and "BCM" mean? 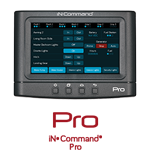 The DC stands for “Display Commander” and BCM for “Body Control Module”. 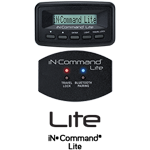 With iN•Command, you’ll be using the DC to communicate with the BCM in order to carry out various functions in your RV. Where is the BCM located? The BCM is typically installed under the floor in the storage area of the RV, but the installation location may vary by manufacturer. Please refer to your owner’s manual for details. The owner’s manual for your system can be found under “Resources” on your system’s page on this website. How do I identify my system by model number? The model numbers should be found on the back of the DC and the front of the BCM. Where do I find software updates? Software updates are system specific and can be found in the “Resources” section of the system page. If your DC is connected to a WiFi network, you can download updates Over-the-Air (OTA). This can be accomplished within “Settings” on your DC. Instructions for performing a software update can be found in the “Resources” section of the system page. Instructions for resetting iN•Command can be found in the “Resources” section of the system page. The Reset Button resets communication between the BCM and DC. It is always located directly on the BCM. How do I turn off the system? Press and hold the Power Button until the DC asks if you would like to shut down. How do I change or clear my passcode? The Bluetooth pairing process varies slightly depending on the system. Pairing instructions and video tutorials can be found in the “Resources” section of the system page. I am unable to operate any functions from my display; battery voltage reads 0VDC. What is wrong? Your DC is attempting to communicate with the BCM but is not able to do so. As a possible quick and easy solution to this problem, try resetting the system. In an attempt to isolate your issue, you can refer to your system’s troubleshooting guide found in the “Resources”section of your system’s page. If the issue persists, please call our Technical Support or visit an RV service center. Why do my slides and awnings say "Disabled" after towing? You are in Travel Lock Out, a safety feature of iN•Command. Travel Lock Out disables all moving motors. Travel Lock Out is engaged when the brake is applied on the tow vehicle. Travel Lock Out can be disengaged with the tow vehicle still connected to allow power from the tow vehicle to take out the slides. Travel Lock Out will re-engage if the brake is applied again. How do I get the iN•Command App? Download the app specific to your iN•Command system on the Google Play Store or Apple App Store. If you’re unsure which app matches your system, click here to select your system and/or browse each system page to help identify your system. Once you have identified your system and have arrived at your system’s page on our website, the download links for the app can be found for both Android and Apple (iOS) at the top of the page next to the app logo. Why aren't my tanks reading correctly on the iN•Command display? iN•Command only reads information provided by the tanks, so this may be an issue with your tanks. Please see a service center for diagnosis. 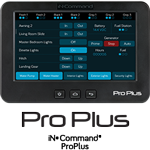 Why doesn't my screen show the correct functions of my RV? The incorrect floor plan could have been loaded to your display by mistake, or the display has been cleared. You should try resetting your floor plan. Instructions for Resetting Floorplan can be found in the “Resources” section of the system page. You may also refer to the animations below for a quick reference. How do I operate the slides and awnings without the display? Electric Slides and Awning Overrides are located on the BCM. NOTE: This does not override hydraulic operations. Why am I getting a Generator Fault? There could be an issue with your generator. Please see a service center for diagnosis. Why am I getting a Water Heart Fault? The likely explanation is that the propane has run dry and the water heater will not ignite because of this. If you do have propane, make sure that your iN•Command system is updated. If issues persist, please see an RV service center for diagnosis. 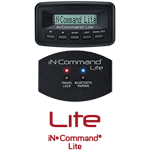 Does the iN•Command system work off of just a 12V battery? 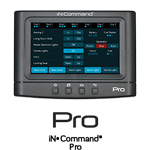 No, you will need both battery power and shore power to fully utilize iN•Command. How can I make the functions on the app match the functions on the display? 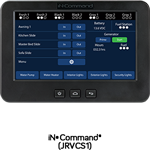 Why doesn't iN•Command control everything in my RV? We are working with a growing number of partners to provide you with complete control of your RV, but not all products from other suppliers are currently compatible with iN•Command®. How do I rename my slides/lights? There is an Edit button in the menu that allows functions to be renamed or repositioned. 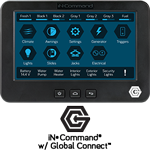 How do I add an AC Unit to iN•Command with Global Connect? If this is on your personal coach, you will want to take your unit to your local RV service center. They will be able to order and install the necessary components to make this possible. Can the Optional Zone be cleared from the display if there is not a second unit installed with iN•Command with Global Connect? The optional zone cannot be cleared from the display due to the software being capable of supporting multiple AC units. The AC will not run when the ambient temperature is above 100°F or below 40°F. Why? Please contact your local RV service center.